ere ye lament the lost. Two figures dashed silently through the darkened woods. Moving with a self-assured grace that bespoke both an intimate familiarity with their surroundings and a singular and burning purpose, an observer might easily mistake the two swift shadows as a pair of some terrible eldritch predator coughed up from the stygian depths of the Eyrewood. However, the unnatural quiet with which the two progressed – not pant of laboured breath, nor crackle of dried leaf to reach the ears – and the manner in which they seemed to melt from shadow to shadow between the great grey boles of these woods, would soon disabuse one of such a notion. Not beast, nor man, nor devil these. Reaching the lee of a crag that jutted out of the brush like unto a great stone dagger stabbing at the leaf clothed evening sky, the pair stopped as one. A third shadow coalesced beside the first two. The young woman gave a low whistle. And they were gone, leaving only darkness and the night breeze. In the depths of the Eyrewood a village stood upon the shores of a great lake. The lake was an inland sea of rare immensity and purity, waters that were still and clear pushed to the horizon and beyond, offering up an ever vigil mirror to the sky. Beautiful and benevolent in its bounty, the lake was strange nonetheless, although strangeness is itself an old and familiar inhabitant of the Eyrewood. The trees of the woods that embraced the waters did not halt at the lake’s edge. Rather they marched out into the lake, and the forest continued unhindered beneath the gleaming surface; the woods flourished inexplicably, green and full, in the emerald depths. Occasionally a fisherman from the village would be taken by storm or deviant current to the centre of the jade expanse, and they would return with tales of immense stone ruins only barely scried far beneath the ripples left by their boats. Fishermen, however, were as notorious for their tall tales as they were for their love of the potent rice wine brewed in the village. The village was a cheerful place that thrived in the bosom of the lake, gathering the ripe fruit that floated to the surface once dropping from the boughs below, taking the queer, legged fish that clung to the submarine branches, and harvesting rice in the shallows. The people of the village had found a delicate balance with the forest; they cleared no land, and for each tree they felled custom demanded they plant two in its place. The villagers believed that it was because of this way of life that they were tolerated, that the Eyrewood suffered them to live there, and while the people were wary of the great eldritch beasts that stalked the sun dappled shade, they took comfort in the safety of their village. Four figures stood amoung the birch trees where moments before there had only been the golden afternoon sunlight pooling and spilling between the eaves, and the fickle breeze toying with the occasional errant falling leaf. Although similar in their forest hued garb and aura of controlled ferocity, their appearances varied greatly. Three of the four stood straight backed and resolute: a grizzled old man, a warrior, grey bearded and one eyes; A woman, tall of stature and her hair in a large silver braid, her eyes glowed green from behind a mask of rough bark that concealed the upper half of her face, but a soft smile lay upon her lips; A girl, beautiful and proud, her raven locks flowed out from under her raised hood, sunlight glinting on the collection of knives belted across her tunic. And then there was the fourth. It stood with its head cocked at a strange broken-necked angle, a smooth white porcelain mask covering its whole face with nary an opening for eye or mouth. In one place, in the position of the right eye, there was a crack from which sprouted a single rose. Cable thick brambles coiled down one of its arms, thorns piercing its flesh and staining its sleeves red. Its cloak was tattered and torn. Before them were two others; A woman kneeling, her palms upwards in her lap in supplication, weeping softly and bleeding from the fresh cuts upon her hands, and a man who stood behind her, attempting to cloak his cowering in bluster and bravado. The four looked on impassively. Still the four stood unmoved. “What is wrong with them?” said the man, nudging the woman with his foot. The man puffed up his chest with self-importance. With a sudden shriek the woman leapt to her feet and struck the man, leaving a wet crimson smear across his face and sending a resounding clap through the quiet forest. She then unleashed a fury of blows beneath which the chief cringed and shrank. It straightened and turned towards the two villagers. With that it made a mockery of a bow before it too vanished with a flourish into the woods. “Well this is a pretty little trap,” whispered the Blade. The three of them – Blade, Greenheart, and Guard – crouched in the deeply shadowed underbrush on the edge of a small glade. Carpeted with lush green moss, the light of the waxen moon over the clearing would have made for an idyllic scene, but for the malevolent violet glow that emanated from the repugnant plague of toadstools and fungal brackets that sprouted from almost every surface. A giant fig tree stood at the far edge. Its fruit hung putrid, huge, and pink, and its swollen whole pulsated and throbbed sluggishly to some unheard beat. Twisted in among its misshapen roots, still and glassy eyed, were the village children. In the middle of the glade, atop a knoll cloaked in feather moss, a small girl sat clapping and laughing at a young boy, some years older than her, capering and dancing madly. White wild flowers bloom among the girl’s hair, slightly wilted, their vitality seemingly robbed by a line of bracket fungus that climbed up her neck and over one side of her face, their undersides glowing with the same purple corruption. The boy too wore similar markings, but the spore had worked much further on him, with toadstools sprouting from his hair and the black lines of fungal filaments visible beneath the skin on his face and arms. In a perverse parody of a dance, he jerked and spasmed as if attached to the strings of a puppet, and his eyes stared forward with the same dead gaze as the other children. They studied the scene in the glade in silence. The girl was now in the throes of a furious tantrum, stomping her feet and screaming. The boy sat slumped forward in front of her. The girl’s disposition skittered and careened like an angry spider in a barrel, one moment yelling demands into the woods, the next giggling and singing. Eventually she sat once more, and began speaking to her silent companion. In another sudden outburst of anger the girl began demanding that her limply docile companion answer her. There was a shadow to her childish fury that hinted at something deeper and infinitely immense. Indeed, a pall of malevolence hung over the whole glade; a strange humidity of ancient hatred. The Guard nodded slowly, frowning. The Briarlock had emerged from the opposite side of the glade and was striding purposefully towards the girl at its centre. The girl watched the masked creature’s approach with a discontented frown upon her face. It stopped before her, then, slowly and with the threat of great malice, extended is briar tangled arm towards her. Suddenly it jerked its head toward the forest’s edge. The girl screamed, and her guardian burst forth from the tree line bringing with it all the avenging fury of the Eyrewood. The grove lion loosed an ear-shattering roar like unto the snapping of a thousand giant boles beneath the tumbling of a hundred boulders. The beast had made great effort to bear the brunt of the Ebb’s assault upon its tiny mistress, and the decay had spread its roots deep. Fungus sprouted all over its face of living wood, with a large twisted clump growing out of, and completely concealing, one eye socket. 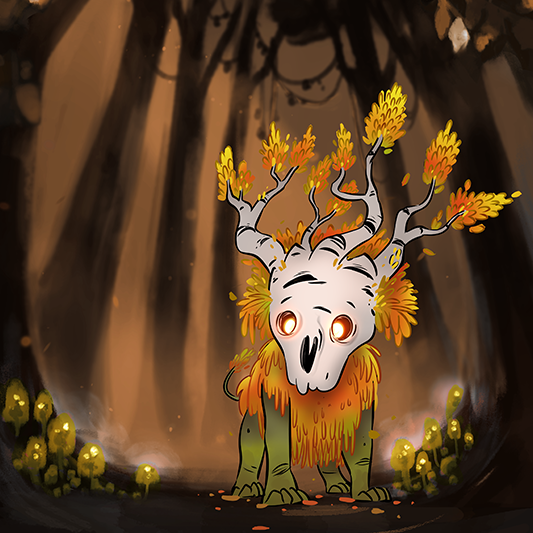 Its enraged bellow revealed the inside of its maw to be carpeted in a glowing, throbbing spore, and its thick mane of leaves was wilted, brown, and riddled with toadstools. Along its back, massive pustules of a diseased hue swelled, ruptured, and then swelled again, releasing a noxious powder into the air. Even in its corrupted state, the massive creature bespoke the grandeur and strength of the Eyrewood. In a single bound it leapt across the clearing, and with one huge claw it swatted the Briarlock away from the girl as if it were no more than a cloth doll. The Briarlock flew backwards, and would have been pulverised against the trunk of a tree had flood of brambles not erupted from beneath its cloak, cushioning the impact then launching it back at its attacker. Landing on the beast’s side, the briarlock lashed its thorned tendrils over it, cruel spikes biting deep into its hide. The grove lion roared in surprise and rage. The girl continued to scream. The trees that ringed the glade began to grow larger and twist into each other in a spiral that was meant to close the clearing to the outside. As if coming out of a spell, the three remaining members of the Thornwatch sprang through the shrinking gaps between the trees as one, blades drawn. Gliders began to alight, skin speckled with the Ebb’s pestilence and eyes shining with an old hunger. But the Blade was already running towards the grove lion. “Harry them well Guardsman,” said the Greenheart beside him, “Put the fear of the Watch into them.” And with that she too sprinted away, running toward the tree that held the children, sword held wide and cloak billowing. The lead nearest glider lunged. The Guard moved with a grace and precision that belied his grey beard and missing eye. He stepped to the side and relieved the glider of its head as it flew. It fell to the ground with two soft thuds, both head and body twitching atop the moss. He stepped forward, slicing his sword across the side of the next creature. It snapped its jaws wildly as blood and viscera spilled across the ground. The guard kicked the nearest glider hard, feeling its bones snapping through the leather of his boot and sending the fiend flying into a group of three of its fellows that went down in a tangle of wing membrane and legs. He then whirled, sinking to one knee, and stabbed unerringly through the eye of a creature that had circled behind him. Its bat-like muzzle snapped spasmodically on the end of the blade as its life fled. Another glider lunged from the side, its fangs sinking into the guard’s sword arm. With his free hand he unsheathed his short sword and drew it across the thing’s throat in a single lightning movement. Its lifeblood spilled over him in a warm spray as he stood. The trees had now twisted completely shut, trapping them all inside. Five of the creatures lay dead or in their final throes. Some score of them remained, eyeing him warily now, with still more continuing to drop from the darkened heights. The Guard threw himself into the pack, swinging and cleaving, dodging and spinning in a dance as old as forged steal. A dervish of blades and death, he was still and tranquil in his heart, giving himself completely to his work and seeking no more than to be the threat amoung his enemies that must not be ignored. The glade was littered with carcasses, but still they came. The pack was giving the thrashing grove lion a wide berth. The Briarlock crawled over it like a demented insect on clawed wooden legs. The beast twisted and bit and raked its attacker with its claws, but always the Briarlock was able to cling to its bulk, sprouting tendrils and sinking in cruel thorns. The Blade would seek an opening and occasionally dart in and bury one of her knives up to its haft in its flesh. This only seemed to irritate the guardian, sparing only a momentary snap of its wooden jaws at the nimble Blade as she danced back out of reach, before returning its attention to the twisted creature that clambered over its back. A number of hafts already protruded from various areas over the grove lion’s body and legs. The Greenheart continued her ministrations, a glowing hand upon the gargantuan fig tree coaxing the children from its tangled bowels. About her, blackened and charred or impaled upon living roots that had erupted from the earth, were the bodies of gliders that had perhaps thought to seek an easier prey and had instead found swift and uncompromising death in her magick. The grove lion seemed to be slowing, red sap seeping sluggishly from a collection of cuts and ugly looking punctures, but not as much as the Briarlock. Its magick was taking a toll upon its own body, thorns ripping and tearing its own flesh with each thick vine that emerged from its body. Blood poured from beneath its cloak, soaking the grove lion’s diseased back. The Blade threw a final knife, lodging in the grove lion’s front shoulder to an angry howl, and drew her short sword. She drew the blade smoothly across her palm, cutting and coating the metal in a vivid crimson. She gripped the haft with both hands above her head then slammed the blade into the ground between her feet, driving it deep into the soft earth. Each of the knives embedded in the raging beast suddenly shone with a cold incandescence, and the grove lion collapsed to the ground with a loud grunt as if some immense weight had suddenly pulled down upon it. It bellowed, straining and jerking, but it was pinned fast to the forest floor. The Briarlock stood atop the fallen behemoth and extended both of its hands. Its arms bulged unnaturally then burst open, twin torrents of thick brambles shooting out to lodge in the grove lion’s back. The vines then began to pulse and thicken, like a mass of leaches drinking thirstily of their host. As they throbbed the Briarlock began to swell in grotesque proportions; first the vines that had been its arms grew to the width of tree trunks in their feasting, then its shoulders and back grew bulbous and huge, tearing its clothing at the seams, until the masked head, tiny by comparison to the abomination the body was becoming, was the only echo of humanity left. With the change in the Briarlock, there also came a change over the glade. The evil looking fungus began to dim and shrivel, while the fig tree began to shrink, its putrid fruit falling to burst overripe on the ground, it now regurgitated the children from its roots faster than the Greenheart could take them. The gliders began to mill uncertainly, hooting and clicking at the Briarlock. The girl stood looking on, her eyes wide with fear. Suddenly, the trees which had made a prison of the glade whipped back into place with a sound like thunder, raining leaves down into the clearing. The girl fled into the forest. “Greenheart! At her heels!” roared the Guard. The Greenheart was already away. The glider pack scattered, the Ebb’s hold over them now too tenuous to drive them through their instincts towards self-preservation. The mark of corruption upon the grove lion finally began to recede and it ceased struggling against its bonds. Proud head laid upon the soil, it breathed heavily and deeply, each exhalation announced by a long shuddering whimper, all the more piteous for coming from such a great beast. The Blade placed a soothing hand upon the creature’s muzzle. Presently the Briarlock released its grip and half rolled, half slid, from atop the grove lion. The guardian’s wounds remained, bright red against its pale green skin, but all sign of the Ebb rot had disappeared. The Briarlock, its body an inadequate vessel for the Ebb it had sucked from the land, was now a huge roiling mass of rapid decay and malformed growth, a tangled ever changing mess of thorns, fungus, and flesh. Great boils swelled, burst, and reformed in a horrible cycle of putrescence all over its body, spitting spore and vapours into the air. Heaving and dragging its bulk painfully, the Briarlock slowly crossed the glade like some nightmare maggot, until it rested in front of the Guard. Stretching out a neck corded with exertion and agony, the Briarlock lowered its head before the old man. He stared down upon the pitiful monstrosity. The Briarlock twisted its head slowly, fixing the guard with its single rosebud eye. It lowered its head once more. The sword fell, barely slowing as it passed through the briarlock’s neck. The gargantuan body slumped lifelessly upon the ground. Thick black smoke sputtered and spewed from the severed neck while globules of a tar like substance dripped thickly from the wound, evaporating before reaching the ground. The grotesque body began to shrink like a leather bladder losing its water, and gradually returned to a semblance of the Briarlock’s original form. Eventually the flow of smoke ceased, leaving only thorn torn remains lying upon the ground. The Briarlock’s rosebud eye began to rise from the decapitated head atop a vine that snaked out through the crack in the porcelain mask. With a soft rustling, other vines began to push up from the body, bearing buds that also opened into bloom as they grew. In a matter of moments the sad corpse was completely hidden and consumed by a magnificent rose bush. Hands resting upon the pommel of his sword, its blade standing in the moss covered earth, the Guard looked on wearily. The knot was nearly fulfilled, and he was tired. The Greenheart sprinted unerringly through the night, the great boles of ancient trees passing her by on either side. Behind her she felt the Ebb swell, then suddenly shudder and recede. She sheathed her sword without slowing. She allowed herself to be pulled towards the soft warm hymn of exultation – of life and growth – that the very trees seemed to sing in the wake of the Daughters of the Eyrewood. Presently she came upon her quarry kneeling in the lily pad speckled shallows of the great lake, crying loudly and with abandon as only the young can do. Gone was the ruddy taint of the Ebb, leaving a sad and frightened young girl child with wild flowers blooming in her hair. A girl child upon whose tiny shoulders the mantle of a god had descended. The Greenheart knelt beside her in the surprisingly warm waters. The influence of the Ebb now departed, the child sought comfort rather than to flee, and buried her face in the woman’s lap, muffling her sobs. Still kneeling, she gathered the child up in her arms. The girl in her arms was already asleep. and lead them home this night. They made a strange procession through the moonlit woods. Two score of children following the Greenheart, the Blade laughing and playing with them as they walked, the Guard bringing up the rear. They walked in double file, and the Greenheart bade them hold hands, for while the girls were themselves once more – happy, alert, and eager to be home – many of the boys were listless and unresponsive. Some of them improved as they walked, others remained distant, as if gazing intently upon vast vistas that only they could see, and had to be guided by the female companion holding their hand. Fenir, the village chief’s son, had not regained consciousness. He lay as if sleeping, though his eyes remained wide open, and no amount of chiding could rouse him to walk or even stand on his own. If there were a price to be paid for the Briarlock’s spell, then it seemed it had been the boys, and Fenir most of all, who had paid it. They had left Kahana in her grove. The Greenheart had returned the sleeping girl to the grove lion, and she had awoken but once to hug the guardian fiercely, burying her face in its lush mane, and healing its hurts without conscious thought. She had then curled up and slept, her head upon its forepaw as it sat vigil over its tiny charge. They arrived at the copse of birch trees near the village on the lake to find great fire built up, and much rejoicing at their return. Each family ran to their child and the village was made whole again. The Guard sought out the village chief. The man was distraught at his son’s condition. Passing the father his son, the Guard said to him, “He lives yet, but I know not whether his mind will return. But for your fear of the Eyrewood you might have called for us sooner and your son not suffered so. Learn from your missteps that his light might not have been extinguished in vain. Lead your people as a leader, love and respect the woods that nurture you, and give thanks to he who sleeps in the lake for his bounty and protection. If you do these things this village will stand for an age.” He left the man to grieve and care for his son. A woman searched among the children, peering at their faces, her motions becoming more and more desperate. She came to the Blade and the Greenheart standing before the copse of birch trees. “My daughter is not here,” said the woman, her voice quavering. Understanding mingled with a deep grief washed over the woman’s face. The Greenheart looked towards the knot of brambles the woman had tied about the tree mere hours ago. The Guard joined them now. On the shores of a great lake, outside a village that sung with merriment, a soft night breeze blew. It stirred the flowers that had been placed in thanks and celebration among an intricate knot of brambles looped around the trunk of a birch tree, tied off wagonwise over twainward.